First up, can you tell us a bit about Guto Llewelyn and his Swansea supporting background? Enjoyed listening to Jack Cast pod – how did that all come about? GL: I’ve been supporting the Swans for nearly 20 years, ever since my Dad found out I liked Man Utd and decided “something had to be done” and took me to the old Vetch Field to see Swansea against Barnet. The glamour of that afternoon clearly captured my imagination because I’ve been watching them ever since. I’m a current affairs journalist by trade but do a lot of football work on the side, including the JackCast podcast which is basically a couple of Swansea-supporting friends getting together to talk nonsense about football. Talking nonsense about football is what it’s all about mate. In fact, it’s the answer to the meaning of life, the universe, and everything. How’s life been back in the Championship so far? Have your expectations changed since the start of the season? Has it changed much? Last time we were in this league was that brilliant season when we went up with Norwich. A lot has changed since then but after years of struggle and ugly football in the Premier League, I’ll be honest I’m enjoying life back in the Championship. Relegation has seen us sell a lot of our big earners and give our youngsters a chance and it’s resulted in the return of good attacking football. At the start of the season, I said I would be happy with a top half finish, but I’ll be honest, this league’s so open there’s no reason why we can’t make the playoffs. The big question is do we want that? There are a lot of Swansea fans who say they would rather stay in the Championship and have a proper rebuild. Blimey, that is a sensible and mature take on it. Not sure there is much room in football for that kind of reasoned logic. Anyway… just two points off the playoffs and seven off the league leaders is okay isn’t it? It’s very good. There was so much change at the club over the summer. We basically tore everything down and started from scratch with a new manager and a new, much smaller squad. Considering the turbulent nature of our summer and the thin, very young squad Graham Potter was left with, he’s worked a minor miracle. Not only is he getting results, he’s doing it by playing stunning football. It’s fun to watch the Swans at the moment. It wasn’t until I had a look at your squad that I realised how much it has changed (although that obviously tends to happen when you get relegated). You’re now shorn of some stalwarts who were there for much of your Premier League journey (Angel, Williams and co). Is it good enough to bounce straight back (even though you may not want to)? The league’s so open this year, there’s no reason why it can’t finish in the top six. There are a lot of clubs in this division who are like the Swans, play good football but are still a work in progress. But we’ve got some very exciting individuals. Connor Roberts has probably been our best player and should be playing Premier League football (but I’m delighted he’s just signed a new contract with the Swans), Joe Rodon and Mike van der Hoorn have formed a solid defensive partnership, former Ipswich boy Bersant Celina does not seem to have listened to anything Mick McCarthy taught him because he’s a joy to watch every week and Dan James has exploded onto the scene. Plus we’ve got Oli McBurnie up front who is one of the best strikers in the Championship. Also, the likes of Roberts, Rodon, James and McBurnie have been sensational. Also, the likes of Jay Fulton and Matt Grimes who didn’t set the world alight on loan at Football League clubs previously, have been surprise packages for us. It’s a squad with a lot of young, quality players but not much depth and that’s what could hold us back. How’s ol’ Leroy Fer getting on? He tends to try and hang around in the PL when his sides get relegated (which they invariably do). You did well to hang on to him. And Martin Olsson? It seems Premier League sides have finally stopped being stupid enough to waste money on Fer. He’s our captain this year, which is strange as he’s always been totally unreliable. In the Championship there are times when he looks a cut above everybody else in the division and times when he looks a liability, which has always been the case with him. I’ve never been his biggest fan and I’m still seeing weaknesses from him at this level even though there are times when he looks incredible. He’s very hot and cold. Martin Olsson has been a reliable performer and adapted well following relegation but has really stiff competition for his starting spot from Matt Grimes, who’s been moved to left-back from midfield. That was an unexpected one. The Leroy Fer you describe is exactly the one I remember! Classy, silky, anonymous and lazy all in the space of ten minutes. Always liked Olsson though. So, who’s going to hurt us tomorrow? And how does Graham Potter’s playing style differ from the Brendan Rodgers ‘Swansea-ola’ years? We probably move the ball slightly quicker under Graham Potter than we did under Rodgers and that’s because we’re not as strong in midfield as we were when we had Leon Britton and Joe Allen running the show. We also find it slightly more difficult to score despite creating a lot of chances. But there are definitely similarities between both sides. The player most likely to score is McBurnie, who already has seven goals this season, but we’ve had eight different scorers this season so we’re not reliant on him. Celina is so creative, and defenders find it very tough to read him, whereas Roberts’s late runs into the box from right-back are a big threat. Dan James on the left wing is also a real livewire, very speedy and a great dribbler. Sounds all positive mate, and we’re similarly full of youthful exuberance right now too. 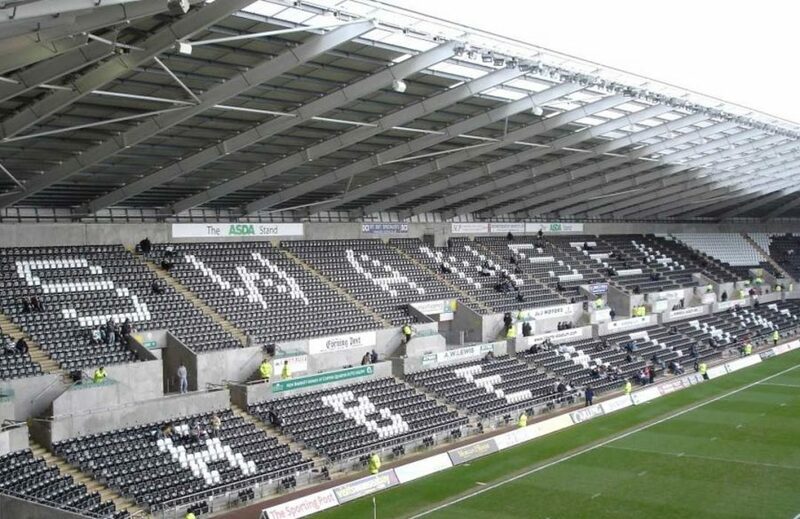 What’s the atmosphere like in the Liberty Stadium these days? Fans fully on board? The atmosphere’s not bad, probably better than when we were doing well in the Premier League. Fans really feel a bond with these youngsters and after years of feeling very little love for our players, that’s a great feeling. With Norwich doing so well, hopefully, we’ll see a good atmosphere again on Saturday. You up to speed on our Germanic revolution? Thoughts? I really like Daniel Farke. I liked what he was trying to do last season and I’m glad Norwich have been patient and allowed him to get on with his job even when some were unsure about him. Even after losing the likes of Maddison and Murphy, I thought Norwich would be competing for a playoff spot, but I’ve been surprised just how good you’ve been. Pukki is a brilliant striker and Leitner and Buendia look like class acts. But the main thing with Norwich is that you look like a complete team and have a great balance. I’ve been really impressed and hope you can keep it up. The recent flood of goals suggests you’re still improving even at the top of the table. Nice to hear some nice things about us. Cheers. The Norwich supporter in me is waiting for our bubble to burst, but there are plenty of signs that this run is borne of a solid base. Early days though. Finally … standard … score prediction? It’s going to be a great game between two good sides. We haven’t lost to any of the teams above us this season and I think that run will continue. We raise our games for the biggest sides and have played most of our best football at home. But I won’t underestimate Norwich, I think it will be a 1-1 draw. Cheers to Guto for his time. Going into the international break top of the league was a tad un-Norwich like, but is something we could definitely get used to it. Being top does have its disadvantages though, as the Real Madrid of the north have found, in that you’re there to be metaphorically shot at. With the Swans taking aim tomorrow, how will we handle the pressure? Penney predicts: No pens dished out for us to stuff up this time around (sorry Mo) – Swansea are a clean side. I’ll go, and happily settle for, an edgy and hard-fought 1-1. Andy assumes: There’s still gas left in the tank, and our possession game will remind Swansea of the days when they were pass masters. 1-0 win. Gaz guesses: Another tricky one to tackle, although I say that every week and they seem to just keep on winning! These runs don’t last forever though, so I’ll go for an entertaining 2-2. Cookie concludes: The break allowed us to bask in top spot and the lads to go to Florida. A tricky fixture to return to, I can see a 2-2 draw. Stew suspects: A tricky one – I’ve always had doubts about warm-weather breaks, and Swansea are desperate to get into the top six. But I believe we’re still focused. 2-1 City. I used to love Kyle Naughton aka grasshopper. Martin Olsson to a slightly lesser extent. Leroy Fer? Not really for me I’m afraid. Never was, never will be. Guto: you’re a gent. Really enjoyed your observations. Leroy Fer didn’t quite get the escape tunnel built this time round so stuck in Swansea, possibly his agent was on holiday sun and sea and forgot the instructions on getting him a transfer when relegated or premiership teams just might think he is a bad luck charm 3 clubs 3 relegations what a CV. Anyway I will carry on predicting wins but I can’t get the scores reet. Leroy Fer’s undoubted talent makes his attitude even harder to forgive. Anger bubbles up inside me every time I see the famous Arsenal “team goal” against us. Yes, Arsenal did some nice things – but Leroy trotted along watching in admiration. Anyone in the current City squad would have at least tried to tackle. The bubble has to burst at some time, but I can’t see that happening this weekend. However, it seems Swansea are making a decent fist of it under Graham Potter so it’s a 1 -1 from me. For me Leroy Fer was basically a Dutch version of Dickson Etuhu. Don’t bust a gut to keep up with play, whichever way it’s going. I’m more surprised Olsson’s agent hasn’t engineered a move for him, something he’s normally very good at when his lad’s not in the PL. I think we’ll keep our good form going tomorrow, so I’ll go for another tight away win, probably just 1-0. I’m less confident about Tuesday at the moment, but we’ll see.